Thanks so much for thinking of me on Memorial Day! Your letters put a big smile on my face! When I got your envelopes, I sat outside under my favorite tree to read them and look at your drawings. It was a gorgeous sunny day, like many days in Vietnam. You asked a lot of questions, so I’ll try to answer some of them. I’m 62 years old and I still feel great. I like to run and swim, which is a good thing since I also love ice cream with lots of bananas, chocolate, and whipped cream. When I was in the Vietnam War way back in 1967‑68, I was only 19 years old. 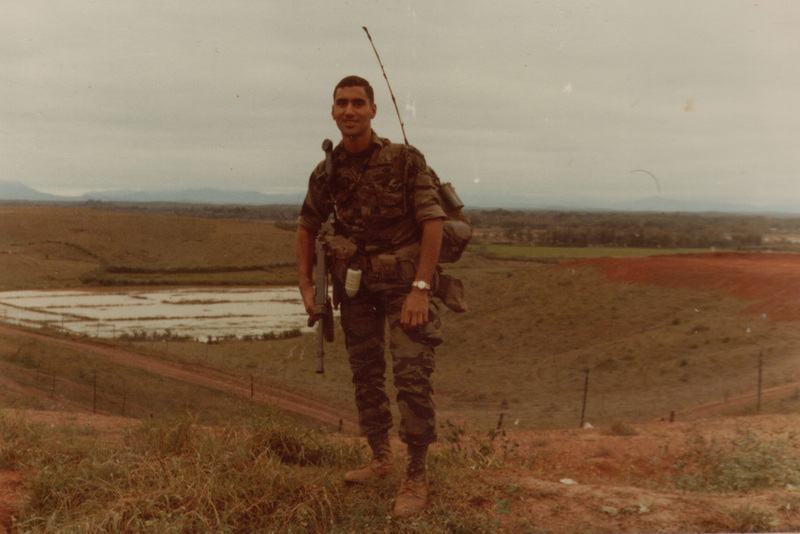 I was a sergeant in the U.S. Army Rangers, and the leader of a five-man team that searched the jungle for enemy soldiers, who we captured so they wouldn’t hurt our guys. You asked how I stayed safe. We wore body armor made of a special cloth that kept bullets out. And we always listened to our teachers, who taught us how we could live and survive in the jungle and not get hurt. It wasn’t really bad for me. I served with a bunch of friends who were a lot of fun to be with, and sometimes we got to climb so high in the mountains, I could touch the clouds drifting by. We would keep climbing through the clouds, till they looked like a feathery white mattress far below us. Other times, we walked through thick green jungles where bananas and mangoes grew all around us. I saw a tiger, snakes, and insects that looked like giant sticks longer than your foot, but none of them bothered us. My favorite memory is of wide, sandy beaches and a big sparkling blue ocean that seemed to go on forever. I jumped and played in the waves and never wanted to leave. I have enclosed two pictures with this letter. One is from when I was a soldier in Vietnam, and the other shows me with one of my granddaughters at Maxwell Air Force Base in Alabama. Her name is Kamea, and she lives in Okinawa, not far from Vietnam. I miss her and will see her again this winter. I can’t wait to visit, because now she has a little sister and because Okinawa is a hot, sunny place just like Vietnam, with lots of palm trees, mountains, and beaches. I hope I made things a little safer when I was a soldier. Take care, and listen to your teachers. You can learn a lot from them.